For the last several years, the OSCF State Chess Championship has been the largest single-day chess tournament in the state. We hope you will join us again on May 5-6 for the 12th Annyal event. The all-volunteer board is busily preparing for the event; rules have been drafted, the location secured, trophies are being ordered, commemorative prizes are being assembled for every player to take home and remember the event by. On Friday, Blitz is back, fast and furious, while Bughouse will return with bug trophies and Crazy Hats in full madhattery. And, of course, Saturday will bring the epitome of high competition to the hundreds of scholastic players who travel to Seaside for the day’s rounds. You don’t want to be left out of this event! 1) Be an Oregon scholastic player, enrolled in K-12 schools, aged 5-19. What does this mean? 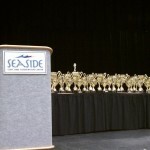 One of the great things about the OSCF State Championship Seaside is that we divide players into grade-and-rating based sections of approximately 32 (or fewer) players, which helps to make sure that every player competes against peers of their age and skill level, and that every player has a reasonable chance to walk away from the event with a great prize. But this means we have to have a good sense of what every player’s skill level is, and for that, they need to have a certain number of games under their belt. Under the scholastic rating system used in the Northwest, for instance (the NWSRS), a player’s rating is considered established after they have played 15 career NWSRS rated games. Once you’ve played 15 career games, you’re set for life on this requirement; your rating will change as you play additional rated events, the total games just keeps going up, and we can always place you in a section with confidence. For more information about this requirement, see this post. The people who are missing only this requirement are listed here. OSCF was formed to encourage more parents, coaches, and community volunteers to organize and hold their own chess tournaments throughout the state. So part of qualifying for State is taking advantage of those opportunities by playing at least two OSCF qualifying tournaments during the relevant year. If you have an established rating but still need a qualifier tournament (or two) in order to go to OSCF State, there are still several tournaments listed on the NWSRS schedule (on Fridays, Saturdays, and Sundays) between now and April 15; you want the events listed in Green. (There are both scholastic events and events at the Portland Chess Club; the latter are generally better for more experienced players, but the G/45 quads, especially, tend to draw a number of less experienced scholastic players.). That’s it. There are some small exceptions – for the real nitty-gritty, see the detailed rules. Or contact us with questions. But in the end, we’re just looking for Oregon scholastic players who have demonstrated a commitment to chess through the prior year, and who we can place in the tournament in a way that lets us be confident that they and their competitors have a fair and fun time.